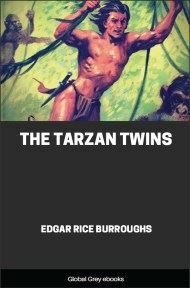 This is the twentieth book in the Tarzan Series. 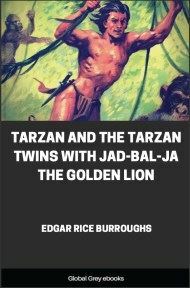 The twenty-first book, Tarzan the Magnificent fits in before this one in order of the stories, but in publishing order, comes after. 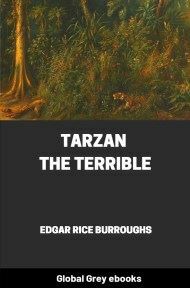 A young man named Brian Gregory has disappeared in Africa, looking for the fabled Father of Diamonds; his father and sister want to go rescue him, and they can only enlist Tarzan's help because they know Captain Paul D`Arnot. THE rainy season was over; and forest and jungle were a riot of lush green starred with myriad tropical blooms, alive with the gorgeous coloring and raucous voices of countless birds, scolding, loving, hunting, escaping; alive with chattering monkeys and buzzing insects which all seemed to be busily engaged in doing things in circles and getting nowhere, much after the fashion of their unhappy cousins who dwell in unlovely jungles of brick and marble and cement. As much a part of the primitive scene as the trees themselves was the Lord of the Jungle, lolling at his ease on the back of Tantor, the elephant, lazing in the mottled sunlight of the noonday jungle. Apparently oblivious to all his surroundings was the ape-man, yet his every sense was alert to all that passed about him; and his hearing and his sense of smell reached out far beyond the visible scene. It was to the latter that Usha, the wind, bore a warning, to his sensitive nostrils—the scent spoor of an approaching Gomangani. Instantly Tarzan was galvanized into alert watchfulness. He did not seek to conceal himself nor escape, for he knew that only one native was approaching. Had there been more, he would have taken to the trees and watched their approach from the concealment of the foliage of some mighty patriarch of the forest, for it is only by eternal vigilance that a denizen of the jungle survives the constant threat of the greatest of all killers—man. Tarzan seldom thought of himself as a man. From infancy he had been raised by beasts among beasts, and he had been almost full grown before he had seen a man. Subconsciously, he classed them with Numa, the lion, and Sheeta, the panther; with Bolgani, the gorilla, and Histah, the snake, and such other blood enemies as his environment afforded. 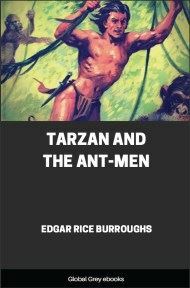 Crouching upon the great back of Tantor, ready for any eventuality, Tarzan watched the trail along which the man was approaching. 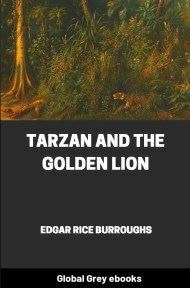 Already Tantor was becoming restless, for he, too, had caught the scent spoor of the man; but Tarzan quieted him with a word; and the huge bull, obedient, stood motionless. Presently the man appeared at a turn in the trail, and Tarzan relaxed. The native discovered the ape-man almost simultaneously, and stopped; then he ran forward and dropped to his knees in front of the Lord of the Jungle. "Greetings, Big Bwana!" he cried. "Greetings, Ogabi!" replied the ape-man. "Why is Ogabi here? Why is he not in his own country tending his cattle?" "Ogabi looks for the Big Bwana." answered the black. "Ogabi has joined white bwana's safari. Ogabi, askari. White bwana Gregory send Ogabi find Tarzan." "I don't know any white bwana, Gregory," objected the ape-man. "Why did he send you to find me?" "White bwana send Ogabi bring Tarzan. Must see Tarzan." "Big village, Loango," explained Ogabi. Tarzan shook his head. "No," he said; "Tarzan no go." "Bwana Gregory say Tarzan must," insisted Ogabi. "Some bwana lost; Tarzan find." "No," repeated the ape-man. 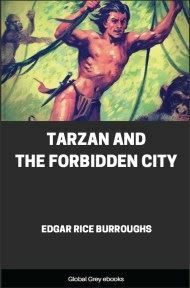 "Tarzan does not like big village. It is full of bad smells and sickness and men and other evils. Tarzan no go." "Bwana d'Arnot say Tarzan come," added Ogabi, as though by second thought. "D'Arnot in Loango?" demanded the ape-man. "Why didn't you say so in the first place? 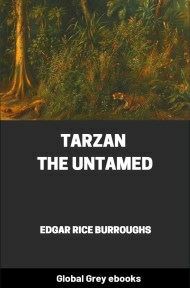 For bwana d'Arnot, Tarzan come." And so, with a parting word to Tantor, Tarzan swung off along the trail in the direction of Loango, while Ogabi trotted peacefully at his heels. It was hot in Loango; but that was nothing unusual, as it is always hot in Loango. However, heat in the tropics has its recompenses, one of which is a tall glass filled with shaved ice, rum, sugar, and lime juice. A group on the terrace of a small colonial hotel in Loango was enjoying several recompenses. Captain Paul d'Arnot of the French navy stretched his long legs comfortably beneath the table and permitted his eyes to enjoy the profile of Helen Gregory as he slowly sipped his drink. Helen's profile was well worth anyone's scrutiny, and not her profile alone. Blonde, nineteen, vivacious, with a carriage and a figure charming in chic sport clothes, she was as cool and inviting as the frosted glass before her. "Do you think this Tarzan you have sent for can find Brian, Captain d'Arnot?" she asked, turning her face toward him after a brief reverie. "Your full face is even more beautiful than your profile," thought d'Arnot, "but I like your profile better because I can stare at it without being noticed." Aloud, he said, "There is none knows Africa better than Tarzan, Mam'selle; but you must remember that your brother has been missing two years. Perhaps?"